Calgary is located in the grassland region of southern Alberta where the foothills of the Rocky Mountains meet the prairie lands and the Elbow River converges with the Bow River. 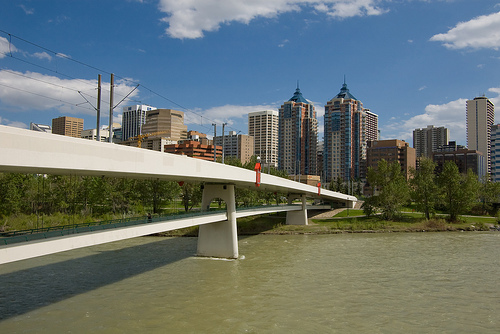 With a metro population of over 1.2 million people, Calgary is the largest city in Alberta – larger than the provincial capital of Edmonton – and the third largest municipality in Canada. The city of Calgary covers an area of over 848 square kilometres (327 square miles) while the Calgary Region includes a metro area of over 5,110 square kilometres (1,973 square miles), making Calgary the densest urban area in Alberta. 15 municipalities currently make up the Calgary Regional Partnership, including the cities of Calgary and Airdrie; the surrounding county of Rocky View and the Municipal District Foothills; and the towns of Banff, Black Diamond, Canmore, Chestermere, Cochrane, Crossfield, High River, Irricana, Nanton, Okotoks, Strathmore, and Turner Valley. Though four of the towns (Banff, Canmore, Nanton and Strathmore) are outside the Calgary Region's boundaries, they work with the Calgary Region municipalities to plan and grow the greater region. The city of Calgary is the urban heart of southern Alberta, and is recognized as a tourism, agriculture and petroleum hub within the area. It is the southern anchor of the Calgary-Edmonton Corridor, and home to most of the region's residents. The city of Calgary is divided into four distinct quadrants, and all of its street address are appended with the appropriate quadrant information (NW, NE, SE or SW). Streets run north-south and avenues run east-west, with Centre Avenue separating the north from the south and Centre Street separating the east from the west. Streets and avenues are numbered starting at Centre and Centre, with those closest to the core having the smallest numbers. At the core of Calgary is the City Centre or Downtown area, which contains the Downtown West End, the Downtown Commercial Core, and the Downtown East Village. The Commercial Core is subdivided into several individual districts, including the Stephen Avenue retail core, the Entertainment District, and Calgary's Government district. 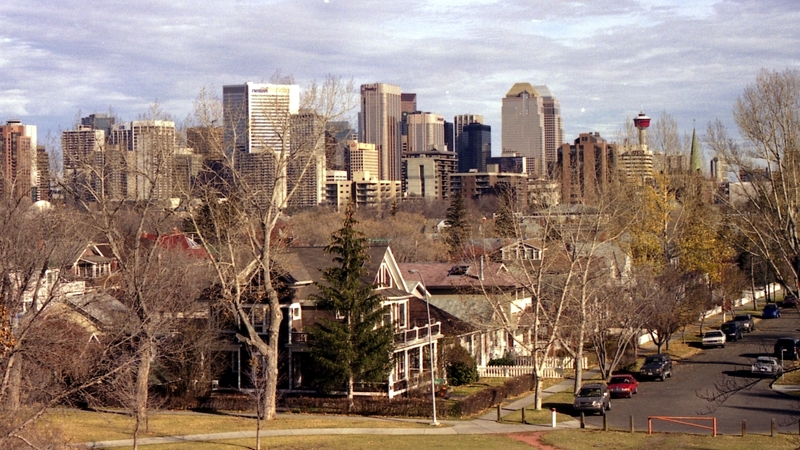 The nearby residential and mixed use neighbourhoods of Chinatown, Eau Claire and Beltline are also considered part of the Calgary City Centre area. Beltline is the densest urban neighbourhood within Calgary and the focus of major rejuvenation initiatives. It includes the communities of West Connaught, Connaught Centre, Victoria Park, and East Victoria Park, neighbourhoods that contain well known Calgary areas such as Midtown, the Design District, 4th Street, Uptown, the Warehouse District, and the Rivers District. Radiating from Calgary's City Centre are the inner city communities, including Sunnyside, Crescent Heights, Inglewood, Briar Hill, Renfrew, Bridgeland, Mount Royal, Mission, Montgomery, Ramsay, and Radisson Heights. This area has a high percentage of multi-family housing and smaller, older style single family homes, but also includes the high-end Upper Mount Royal area that contains some of Calgary's most expensive real estate and a mix of historic and new architecture. 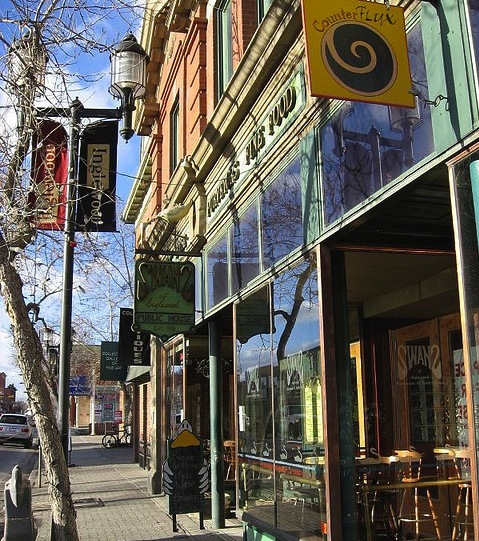 Surrounding the inner city are the mature, established neighbourhoods of Calgary, including Mount Pleasant and Rosedale to the north; Killarney, Bankview and Altadore to the south; Glendale, Parkdale and Bowness to the west; and Forest Lawn to the east. These mid to high density communities offer a mix of housing options from single family homes and duplexes to townhouses, condominiums, and walk-up apartments. Beyond those areas are the Calgary suburban communities and subdivisions where single family detached homes make up the largest percentage of the available real estate. 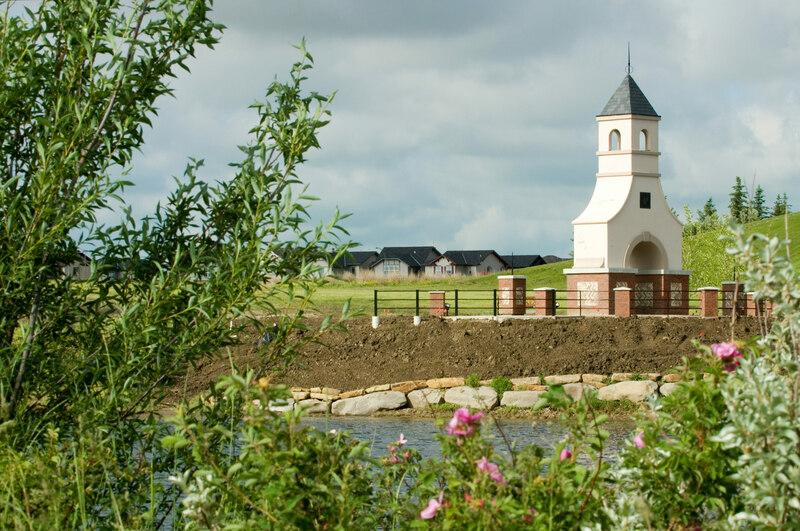 Suburban communities in the outskirts of Calgary include Coventry Hills, McKenzie Towne, Somerset, Country Hills, Hamptons, Taradale, and Royal Oak. Get better acquainted with the city of Calgary: visit the city website, read about the city's history, and learn more about Calgary's city council, services, transportation and events. Is this your first time in Calgary and southern Alberta? Check out these sites before you visit us! Calgary has a variety of shopping options, from large malls to unique boutiques along 17th Avenue. Calgarians have a reputation for being dedicated sports fans, and here are some of the teams they cheer for. Calgary has a wide range of post secondary options for students interested in continuing their education. 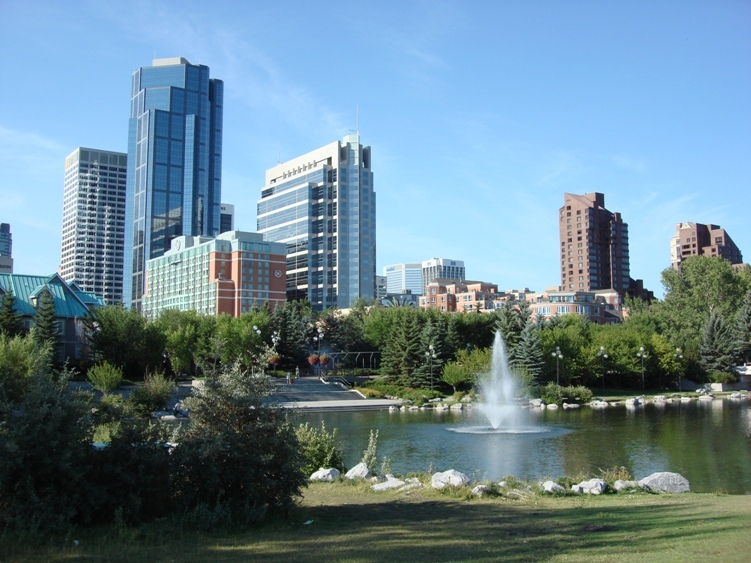 The city of Calgary is home to over 5,000 urban park sites of varying sizes, including river valley parks bordering sections of both the Elbow River and the Bow River. A network of over 70 kilometres of pathways connect Calgary's neighbourhoods and greenspaces, and is recognized as one of the most extensive multi-use trail systems in North America. These parks and pathways are enjoyed year round by Calgarians for outdoor activities such as picnics, cycling, running, hiking, tobogganing and cross-country skiing. Fish Creek Provincial Park can be found winding its way through the southern parts of Calgary. As one of the largest urban parks in North America, it spans 19 kilometres from east to west and is three times the size of Stanley Park in Vancouver. Here Calgarians have access to on-site camping facilities, stables, and a lake for swimming. 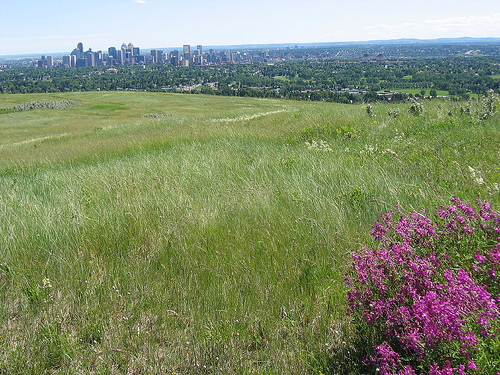 Northwest Calgary is home to Nose Hill Park, one of the largest natural environment parks in Canada and the second largest parkland area in Calgary. Covering 11 square kilometres, this greenspace has been preserved as a unique grassland ecosystem native to southern Alberta, and is home to almost 200 wildlife species in addition to its endangered plant systems. The park is surrounded by 12 residential communities and is a popular place for Calgary hikers during every season. The immensely popular Calgary Zoo is located just east of Calgary's Downtown on St. George's Island and is a popular destination for residents and tourists alike. As the second largest zoo in Canada, the Calgary Zoo features 8 unique areas, 290 different species, and has over 1,000 animals. Prince's Island in downtown Calgary provides downtown residents with picnic and playground areas, and hosts more festivals and events than any other park in Calgary. The Calgary Music Festival, Shakespeare in the Park, Canada Day and Heritage Day are just a few of the annual events that draw enthusiastic crowds to Prince's Island Park. These are some of Calgary's most well known attractions, including iconic buildings, notable parks, popular public gathering areas, and recreational spots. Calgary has over 70 kilometres of multi-use trails and 5,000 urban parks ranging from small community parks and school playgrounds to a large Provincial parks and protected natural areas. Though many Calgarians live in the outlying suburban areas, the neighbourhoods of Calgary's central districts are growing in popularity and density. There has been a resurgence of interest and cultural activity in inner city areas such as 17th Avenue, Inglewood, and Marda Loop. 17th Avenue running from 14th Street SW to the Calgary Stampede Grounds, known as "Uptown 17th", has become one of Calgary's hippest urban hotspots. Featuring mixed-use commercial and residential space, Uptown 17th is home to a rich variety of shops, cafes, restaurants and nightclubs. Nicknamed the "Red Mile", 17th Avenue is at the heart of the yearly Calgary Stampede festival. The district of Inglewood east of Downtown Calgary has become one of the most eclectic and vibrant cultural centres in the city, and has become the hub of the local Calgary music scene, providing popular music and performance venues such as the new Black Centre, the Ironwood Stage, and Grill. Featuring over 100 unique boutiques, shops and eateries, Inglewood is also home to the one-day Sunfest Festival, the Calgary International Fringe Festival, the Mid-Winter Blues Film Festival, and the International Festival of Animated Objects. Calgary is home to a large number of theatre and performance companies, including Theatre Calgary, the Alberta Ballet, the Calgary Opera, One Yellow Rabbit, the Calgary Philharmonic Orchestra and is the birthplace of the the improve games known as Theatresports. The Calgary Stampede is the world-renowned annual festival, rodeo and exhibition held every year in July. The ten day event — billed as "The Greatest Outdoor Show on Earth" — is attended by over 1 million visitors every year and includes a parade, agriculture shows and competitions, several stage shows, concerts, and First Nations exhibits. The Calgary Stampede is the largest rodeo in the world, one of Canada's largest festivals, and a popular annual tourist attraction. Since its inception in 1912, the Calgary Stampede has become a city-wide celebration of rodeo sports and the western way of life. From theatre and opera to live local music and classic symphonies, Calgary has some truly fantastic live venues and world-recognized theatre companies. Calgary values its rich, diverse heritage and culture, and takes pride in is preservation and presentation. Keep up to date on what's happening in Calgary on a day to day basis with local TV, radio and newspapers. 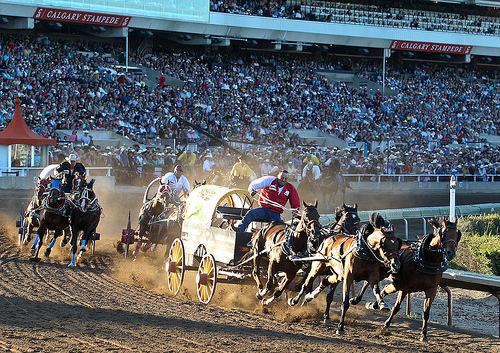 Calgary's most well known festival is the Calgary Stampede, but there are dozens more great events happening year round that make Calgary a great place to live and play. Calgary has a festival for every season!